Firstly Michael aka Ando would not normally be called a legend. But after his "legendary" shuffle home at the Sunny Coast World's I think the lable will stick. Read the full report later either here or in the Tri Reports forum. Primarily it's a spin off on Go Easy's Ten Q's. Geoff mentioned Ando a few times which caused me to pay a bit more attention. A 32 year career with every high and low you could imagine clinched it. And no dwelling on the past either. This guy transcends all the era's and is fully updated. As you might see through the interview. And then the fact that he didn't feel worthy made it even more interesting. A few PM's and we were away. He's not all old school either. Probably a combination of hard work combined with high tech. And association with a few big hitters in the sport too. Michael is busy with work and family so he asked me for more time. We thought of starting early so he could tackle the questions one by one. A formula started by RBR and worked well for Go Easy also. 1. Michael. Will call you Michael or Ando ok with that? Michael for those that don't know you, submit a brief personal bio narrative form. Where were you born and where have you lived. Education and professional status. Marital status. Do you have any genetic links which might link to you ultimately being a good athlete? 2. Ando. All sports played at school and after. Rugby League as you have told me and other? Then running which you eventually became quite good at. Try to bring that up to when you did your first triathlon. Include running and the progression. Tackle those first. Then proceed to Ten Questions. 1. So you had to start somewhere. Let's go back to your first race in 1984. Talk about the lead up. The training and the actual race. 2. You may have partied hard in your early 20's. But as I understand you stopped that abruptly. You went from being a fun runner to a serious runner to a novice triathlete in a relatively short time span. Now put that in perspective. Where would you be now if not for that "transition"?. 3. So very early on you met Brad Bevan and Welchy. And quite a few forum names or ex forum names from around Cronulla. I'm sure you took it all in stride but did it influence you in terms of deeper involvement in the sport? In the training? 4. In fact much later you hooked up with one of them as a coach and maintained that friendship until today. We are out of sequence but talk about that now. Your history with coaches and that one in particular. You might mention here a few of the athletes you trained with in the era. Maybe not as coaches but with a similar hand down effect. 5. So after running 3 marathons and debuing in triathlon in '84. You went on to do just 3 Ironman's. A combination of injury illness and an accident held you back there. So you stopped at age 29 just 3 IM's completed. A good decision or you had no choice at the time? 6. That was your first accident. And you have had 2 or 3 serious accidents in your career. Talk about accidents and recovery from a personal perspective. NB the 3rd accident was recently at the Sunny Coast. Kindly post up the race report or link now so you won't have to rewrite it. As anyone could see it's the stuff of legends. Not too many people actually open the Tri Reports section so they will see it now. 7. Now mate that's a long hard road over 32 years. Some serious lowlights. But some highlights and race wins all over even podiums internationally. The ITU World's for one. Mention now the highlights and don't let your modesty get in the way. 8. Ando. Combining high level training with work and family can be extremely taxing in all areas. In one way or another something has to give. Would you care to talk about that and how you managed it all up to now? 9.Mate I noticed you are still looking ahead. In fact to fulfill everything you have told me you would have to be 70 years old racing 70-75. That's Pitman territory but few have actually been there. Even AP himself is 2 years away. Talk about future goals and how you would strategise to reach those goals? 10.Michael it's only Ten Questions sorry. But you did ask me to get it out early to allow more time. Now you talked earlier about meeting some of the heavy hitters from the early days of triathlon in Australia. But most of those guys are not currently active. 10 A. Why do people especially the top guns leave the sport early? 10 B. Your current peer group also speaks highly of you. Again Geoff et al. Talk about the current guys now and current friendships within triathlon and what it means to you personally. 10 C.Anything else you like to mention? 1. If you were refereeing in Rugby League and let's say its an important game. Lower grade final but no video ref. A breakway ensues and you keep up with play. There's a 2 man overlap and a try is on. The defender ignores the tackle and goes for the interception. Juggles the ball but spills it forward. There is no advantage so you blow up play. 2. Australia has not produced many world class long distance runners on the male side. Landy and Herb Elliot were milers so that's middle distance. Lisa Martin has been covered in a previous Ten Q's. In the modern era (Post WW2) we have had 2 world class long distance runners who won international events or set world records in a period of dominance. Who would those 2 well known runners be? 3. Which Australian or NZ Trotter/Pacer won over 100 races. Both well known names but the older horse completed his century in the USA. Two names please. EDIT: Because one such horse was a pure NZ bred but raced in NZ, Oz and USA. There are 3 possible names not 2.
and I come back to the forum and 10 + questions ! . Like most Michaels I answer to Mike Mick and Michael (my mum would call when in trouble!) also MJA and Eric - was a school nickname. “HEY YOU!” will work too. But of course, as we are in oz, Ando is very common J. Born Darlinghurst to a 16 yold mum and unknown dad (by birth certificate at least), I was adopted out at 3 weeks of age. Loving family, I grew up in a fibro 3 bed in Sydney’s western suburb of Guildford. School was the “school of life / hard knocks” at various catholic schools of Granville, Lidcombe and Auburn. Apart from the friends, I hated school and rejected authority eg I failed 5 of 6 subjects in year 9… very very lazy and arrogant. I survived school (i.e. not expelled) probably due to being ok at sport and my parents paying the fees. I got a job after school when I turned 13yold. 5 days a week cleaning a butcher shop (as a side the owner was a very good cyclist winning Goulburn to Liverpool a few times etc.. but back then I didn’t give a stuff). I got out of school at the end of year 10. My underlying knowledge and I guess intelligence made up for academic laziness and allowed me to get a job at the Commonwealth Bank (it was test based acceptance). 16 years old I was working in Martin Place Sydney, with a bunch of blokes with drinking problems and a pub just down the fire stairs. Nightly occurrence, but sometimes starting at 2:30pm. I went out near every night to drink, see a band, go up the Cross etc. Lotsa stuff I’d rather forget. Living – Various places, sometimes settled via girlfriends. I moved to Allawah at age of 22, back out west for a while, and then north, and finally in very early 90’s to Manly on the Northern Beaches, a place I had travelled to almost every summer weekend between 1974-78 - as a hated Westie via bus, 2 trains and a ferry. Married. Las Vegas yr 2000. We met in 1995. My wife has done one Tri, she’s a good swimmer and runner, not so happy on the bike J. She spends so much of her energy raising my beautiful gals “S” 15 and “K” 11 yold. Genetic Links to being a good athlete? Lol! Well if I do I am underperforming! Adopted, I don’t know much. My blood grandmother (is that right term? ), told me her dad (or grandfather?) was a very good cyclist. Introduced to Rugby League in 1966 in the under 6’s. Loved it. Massive Souths fan. In high school my peers were very good winning the all schools High School knockout 4 years running. I was a bit of a benchwarmer. I would always top the tackle count but I had no speed and my ball skills were not great. In late teens 20s I played A Grade rugby league for Commonwealth Bank in the business house comp (at 19/20yold some of those 30 year old guys just loved hurting you!). At the same time my best mate made Western Suburbs First Grade - 1981. I learnt to swim a bit late – 8yold. Always loved it. Did it for rep for school sport but I was always the slowest in the swim team, but I always trained the most. I have a “Most Consistent” award at home somewhere… I think the teacher felt sorry for me J. In my teens I loved the surf culture and I never went in a pool from leaving school till I was about 21yold. Hated that old pool chlorine smell! I played golf and squash but not seriously or well. Then… in April 1983 I’m in the pub about 8pm. Back page of the afternoon newspaper (Daily Mirror) has story about the upcoming Wang Australian Marathon. 42ks. I joke I am going to do that. My mates laugh, I’m a p’head not a runner! $200 of bets later I am on the hook to run a marathon. Next day I am too hungover to run (whatever “run” means…) so I go to Bob Talays Running Shop and buy a book on running. I was lucky, it was Arthur Lydiard’s “Run to the Top”. I went home, read it and wrote a training program. It’s still a bible to some today. I trained for six weeks, injured, nothing for the last two. $200 was a lot of coin in 1983. I Panadoled up and started at the very back. 4h40mins later I was $200 better off, or $400 better off than what it looked like prior to race start. I ran 2 more marathons in the next year. Got my time down to 3h 20mins - I was 23 … I had no real idea how to hurt, or race. I ran fun runs almost every weekend. At one of them (I think late 1983) someone handed me a flyer for a “triathlon” at Cronulla I think. Oh… I’d seen that triathlon thing - Julie Moss (1982) and those Scott dudes (were they all called Scott? )… one day I’ll do one of those. In middle 1984 my girlfriend seemed to not like me running, so I ended up in a bike shop! I bought the owners bike. Lovely Columbus SL with Campag Super record. A few weeks later I had done a race or two out at Leppington with the “old” Pro riders (I had been schooled in how to ride and train in a bunch by then). Later I did a race or two with LACC (Lidcombe Auburn Cycling Club). Will ask Roxi to pin this thread so look for it at the top of the main forum. Don't ask me why that quote box appears below I have no idea. Mid 1984 post my third marathon I started to think about that “one day” and I bought a great bike - handmade Columbus SL tubing, top of the line Campag, super light tubular rims (we called ‘em singles back then). I soon learnt how expensive the sport was with flats and new tyres, dented rims, gluing tyres, new cables etc etc. I met a few good junior riders 16/17yold (I was 22), and trained with them and they introduced me to the “old pros” - professional riders” (as in they raced for $10 prize money on weekends). These guys skilled me up on sitting a wheel, doing a turn, no half wheeling etc etc. Soon I entered a couple of club bike races - handicaps on flat courses thank goodness . I was actually winning one of those races but fell off in the wet on a corner with about 200m to go! So my frist tri… I am not 100pct sure how I found out about this race. But it was run by Hills Council as part of the Orange Blossom festival. It was I think a 1500m swim, 40k bike and 15k run from memory. My running was ok and now I was riding ok, so I got back into the chlorine pool and swam a few times a week. I turned up mid Sept 1984 at the Wisemans ferry with no idea what to expect. A few / memories highlights. Mid sept, the water was cold, no one had wetsuits. The run is also a blur – hot - it was long time ago! t was a lot of fun. The results (copy below) came out about 3 months later and only after I called and hassled a council employee. Shorty answer. Not here. I didn't expect to live to 30. I was off the rails and heading in a bad direction. FYI I was MOP (actually I think I averaged 17% off the winners time in my races in 1980's . I was in awe of so many top athletes I will need to write a list. Might need a bottle of wine to help. Triathletes were weird or freaks, or maybe admired. I ran at lunchtime in Sydney CBD and with runners or at Bankstown Sports (The Crest) track. Trained Tue and Thu nights and raced Sat with Lidcombe Auburn Cycle Club (LACC) and swam with the school kids in the ams. I worked a bit part time at Peter Bundy Cycles Bike shop at Guildford. His dad (Jim Bundy) made frames - I helped him a few times. Peter took on the world with full page sale ads in the back page of Triathlon Sports cutting margins etc. At the same time, they sponsored a lot of the Cronulla guys, Tony Unicomb is the one I remember visiting the shop the most. He was a nice guy, never knew him closely but liked him. Rick Pallister, Mick Maroney, Southwells.. wow they punched out some good athletes Cronulla way. They were all a class above me (oh, memory… while I was working with Peter he showed me a request for sponsorship from a very young Michelle Jones. Nicely presented, but I said I didn’t really know her. I think he threw her CV in the bin… lol – L!). I met some great people through Peter's shop, lots of quality cyclists and tri people. Had a bit to do with the Sydney to Melbourne Westfield race and other weird enurance events. Of the people I became friends with, none was nicer that Ched Townes, Nepean organizer, blind athlete, future Ironman. He was the funniest guy. One night post a Port Macquarie Olympic race I went to dinner with Ched and his wife Judy and about 6 others. Brad Bevan and Greg Welch being two of them. I wasn’t star struck, but it was pretty cool. Greg was his cheeky self, Brad seemed a little shy, later Spot Anderson turned up doing Monty Python impersonations for the restaurant - lol. I got to know lots of people, but from a distance. Never felt quite good enough to mix with the FOP dudes. The later part of the question says "did it influence you in terms of deeper involvement in the sport? In the training?" I admired these guys and gals from afar. I would look at their times and try and work out how I could match them, what did I need to do etc. I read everything I could..... I loved the sports science side of things and bought one of the first Polar heart rate monitors ever sold to retail in Australia. I went and got vo2 max and lactate tests. I was thirsty for how the body worked and how one could get faster, go longer etc. I had seen Ron Bonham around (he was in the first tri I had did, he was a v good cyclist and I think he had done Hawaii). One time post a tri out at Dubbo - April 1988. Ron and wife Louise were giving a talk on what you needed to be doing to do an Ironman. Forster was about 6 weeks away and I was way short of the ks they stated. But I kinda saw it as a challenge. I had actually entered the 2 MMM Ironman Tri in Sydney in 1984 but had bad ITB and had to pull out... And 85 Forster I had a very bad accident on the bike a few months before.. so this seemed the right time to do an Ironman (I think it was only the third one run in oz...), so to hell with what ks they said you needed to be doing, I entered the next day (actually it was a few days after - I remember I needed to get a sign off from an MD that you were fit enough to do the race_ . As per above, from 1984 to 1988 I trained with single sport coaches, but nothing very dedicated. In 1989 for me things started to change and there were three “influences” over the next few years. I met Ken Graham at Cumberland College (now part of Uni NSW I think. I still see Ken today; he is head guy at NSW Ins. Sport). I had a 4 months Ironman specific program written for me with review every 4 weeks. You would not call it coaching, well maybe we did back then… Did some Vo2 max and lactate testing, enjoyed working heart rates into the program and trying to be a bit scientific. Pretty rare stuff back in 1989 I guess.. at least for a MOPr. I was lucky enough to spend a bit of time with Ron Bonham and his wife, Louise McKinley-Bonham (oz hall of fame member). Late 89, Ron was trying to be a full time Tri coach (I guess Col Stewart was doing this in Qld, Sutto?, I think Ron ended up the Australian team coach in early 90’s). Ron was looking for some people to build his squad numbers and he was a regular at the bike shop I helped at. I got an invite. Wife Louise had been a bit of a benchmark for me over the years. I tried to match her times. She was a hard trainer. Real hard. Training with her taught me how to hurt. Dug the deepest of anyone I had trained with (then again I didn’t train with elite guys…). I did swimming and some motor pacing with her. Through Ron I got exposure to some tri Australian rep team programs on phycology and. I was very lucky, in over my head re the talent sitting around me! Around this time another Bundy bike shop frequenter was former WA state swimmer Mark Anderson - who had turned his hand to Tris. Mark was a top 10 Forster athlete (1990?) and often had good battles with the Cronulla elite. Mark was kind enough to let me train with him lots – which often meant putting flippers on to chase him in the pool, drafting on the bike and hoping he would wait up a bit when we ran. I dropped out of the sport and went to running mostly from 1993 till 2011. Doing the odd tri every now and again, Olympics and a half or two. I got kinda serious again in 2011 but was unable to commit to any one training program, always questioning myself. I was burning time at home and work thinking about what training I should do. Frustrated and chatting to local tri guy, bike fitter and trannie Ben Hammond (BH?) suggested I speak with Matt Koorey. ..Matt…. I remember him as that little whipper snapper kid that went to 1990 Comm Games. A gun. Same guy that had won an Ironman or two, raced in St George / Tooheys Blue TV series. Well… ok. So I did a day of research on him and then called. He must have been near 40yold, and despite his CV, I still thought of him as a kid. lol. We had a long chat… Matt trying so see if I was the right fit for him. I got the impression he would say no thanks even if I had the cash and wanted him. One of the first things I remember was Matt listening to me talk and when I said I had been following Joe Friel periodization etc. he said his books were useful… for propping up your front wheel when on a turbo trainer! Lol .. before long we had a face to face meeting (I had to laugh when I saw his library, there were so many books I had read over the years). He took a long time to get to know me, what the stressors were, work, home etc. ability to handle volume etc. Having 3 kids like my 2, he also knew the importance of making training work around family. Matt asked for commitment. He would answer questions but it was his way… or the highway. A few times in the first month or two I thought I would get the sack. I admired that, and it helped build commitment. The work with Matt seemed a bit boring eg I had mates that were nowhere near as good as cyclists as me, not prepared to ride as slow as I did on Sunday rides. Soon I was traing alone all of the time. Matt took me from MOP to medals in almost every race I entered. Amazing success for me especially given my past. I still remember the day I went past Mark Anderson (above) in Cairns 70.3 on the bike, and again later on the run - being bewildered I that it was happening, I didn’t belong up here. We had a good coach pupil relationship .. and I know there are many, many times he knew me better than myself and certainly anyone else. Great guy. I would not hesitate to suggest that he is a great coach and if you want to improve he is your man. More important than any tri success, Matt has turned out to be a great friend. I haven’t been coached by him for two years now. But he is always there for me with some free advice and often not about Tris at all. He is someone that genuinely cares. If he has a fault he is too hard on himself! 1988 Did it for fun, just to complete. 1989 Had a roll over car accident (not my fault! and 2 weeks later first ride out hit by a car, couldn’t run for weeks. Shuffled the race, disappointed, determined. 1990 - Gave up 12 months of my life to train. Moved home with parents for support / ease. Trained up to 30 hours a week. 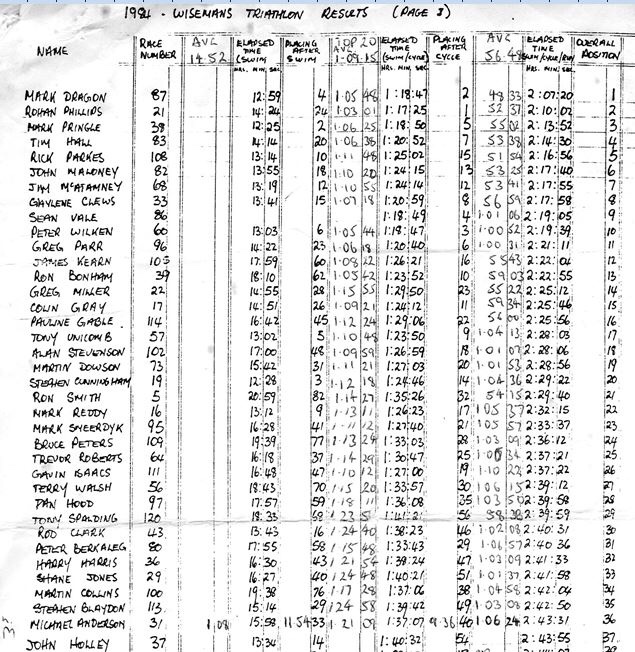 Averages in 1990 were running at 14ks swim, 385 bike, 83 run. I was flying. 1985 was the first biggie. Flying down Roseville Bridge in Jan 1985 (training for the 2Day FM Triathlon). I saw 71.1 kph on my Cateye computer. BANG sidewall of the front tyre blows out. No helmets back then. Side of head still bears a scar. Shoulder broken, leg ripped out and lots muscles tendons etc not ever been the same. There was a doctors strike in Sydney at the time. The ambulance could not get an ER to take me. And once they did a few hours later no beds were available. I didn’t stand for 2 weeks. I near cried when I walked a few meters. It was awful. I never thought about giving up. Just did rehab with physio acupuncture etc. learnt to walk and jog again. Think I was kinda ok 9 months later, though plenty of issues pop up even today that relate back to that accident. 2014 Four months on crutches with no weight bearing on my leg. I had a stress fracture in my femur which I trained through and it became a full blown fracture. Did Cairns 70.3 and got 2nd before I went and had an x-ray. Full break, dead bits of bones. Again looked like may never run again and a partial knee replacement was likely. I just manage it now with even less ks. It was a real slow comeback. 6 months till I ran 10ks I think..
9. Mate I noticed you are still looking ahead. In fact to fulfil everything you have told me you would have to be 70 years old racing 70-75. That's Pitman territory but few have actually been there. Even AP himself is 2 years away. Talk about future goals and how you would strategise to reach those goals? I had this thought a few weeks back…. I could be one of the first people to do a Tri 50 years after their first one…. I did my first tri at the age of 22. Not too many people were doing tris in 1984, and few people were younger than me. In 2024, it will be my 40th year Anniversary. I hope to race Nepean as it was the 2nd or 3rd race I ever did in that first year. Re AP – these guys are amazing and re defining science on what elder humas can do, at least in the context of sport (I guess lots of old people have worked physical jobs till late in life). By the way in the 80’s Fred Nudson (sic ?) was a hero, elder guy who raced very well. Paul Everys mum was another that amazed me. re AP types, in the Nepean race in 1984, the first guy home in over 40’s was this guy, still going today http://www.abc.net.au/news/2014-03-28/ironman-veteran/5353126 Geoff Thorson Thorsa is a real legend. 72 yold now I think. And I think he just did his 25th Kona.. maybe in a row. He and his wife (Bev also a legend as a volunteer in Hawaii) are a lovely loving couple and it’s so nice to see that. Geoff is in my Triclub (or maybe I should say I am in his!). I think there is some sense in use it or lose. I’ve had a lot of injuries over the years, there are some serious physical imbalances I need to work on. Some of the stuff Fitness Buddy posts I need to act on. I need some functional platies type stuff to be added post this last accident my body is very “lopsided” shall we say. Lots of imbalances. I can get the aerobic system up, but the foundation needs work if I am to be doing this in another 20 years! Also my bone density is not as good as it should be so I need to watch that closely (the femur break showed this up). My (4th) Retirement Race. 2016 WTC 70.3 World Championships - Sunshine Coast, Queensland. I had been to a few world champs over the years, but this was the strongest field by far, and the hardest to qualify for. All up there were appx 3000 athletes across all age groups. 35pct female. 114 starters in my old man’s age group (55+). 28 from Oz. 29 from US. The rest from all over the world. I had been fortunate enough to win my age group in a race at Geelong earlier in the year. A bit of a rough trot post this with my mum dying, and some illness had me not doing much from middle Feb. till July (well apart from two races on 3 week blocks of training each). Three months out I was not committed to the event as it was on Father's Day and the family couldn't / wouldn't come. But it was a World Champs on home soil and had an itch that I needed to scratch...it kept me awake at night… So an extra focus for 8 or so weeks of solid early am starts and squashing things in gave me some sort of “base”. Not as good as last few years but I was kinda confident of at least time trialling v's myself well, if not actually "racing" others. And it was going to be cool to be on the start line with such a good list of local and international athletes. I Wondered pre pace. Could I finish in top half? Top quartile? Top 20? Top 10.. that was the hope but ssshh don’t tell anyone …. To help me get set in the last 8 weeks I had some good help. Former coach and mate Matt Koorey gave me a few tips about getting to where I wanted to be. Old friend Ken Graham at NSWIS suggested I do some altitude training (I did 6 weeks of 3x 60 to 100 mins on a treadmill at 3500m). And a few mates gave me a gee up when the training seemed a bit hard and 3000m in the pool in the dark in winter just plain sucked. A few work days off mid-week here and there added to what was a really good training block. My heart rate and power numbers were really going well. Happy. Coming into the last week I was pumped! A last minute funeral (Uncle) meant a change of plans re travel and I left Sydney on the Friday. Landing in Brisbane, I grabbed a car and drove to Sunshine Coast, picked up Matt Korrey and went for a drive over the course with my prime goal to get a look at “that hill”, the one that had bene a hot topic on trannies… the one I had bought a new cassette for (the 11-32), - bought online so no one would laugh at me asking for a 32! I am sure it was going to look weird on a disc on a Cervelo P5! But one look at the hill and I felt I was the one laughing now. Everyone else would be 150% of FTP and I will just spin away at FTP ish. To me the course looked great. Some wind chop on the water and a warm day forecast. I roomed with some cool people from Tri Club real close to the race start. All was ideal. Bring it on! Love the late start. 7:45am I think from memory. Had a friend zip my wetsuit up, plenty of time, no tight bits under the arms. No rushing around, so good Ego parked I had an easy aerobic paced swim. Sat on feet and hips and got dragged along. I haven't been swimming as much, so it was not the place to push. This was the plan and I stuck to it. Something about being in a strong field took the pressure off trying to be out of the water with the leaders, and I came out of the 1.9k swim in 30th position of 112 competitors in my age group. Given swimming only takes up about 10 pct of the total time in a tri, I was happy with that. I didn't swallow too much of the blue pacific and no sharks ate me, was even kinda enjoyable. Hey I had just bodysurfed a wave in, bet most of those from overseas didn't that's got to be 10 seconds free! Running up the beach, reminding myself, long day ahead, solid bike and run course, plenty of time to chip away at those in front… good day ahead. My plan was to ride the first half of the bike (ie the rollers out of town and the flat bit north on the motorway) keeping as aero efficient position as possible, with a heart rate ceiling of 135, and keep a close eye on my power meter - 220w CAP. It was meant to be controlled. Half way through, the execution was working perfectly. I had moved from 30th to 16th in my age group and wasn't even really trying yet (In truth had no idea where I was relatively, but I did know I was passing competitors in my age group - by the numbers tattooed on their arms). Large packs that were drafting in behind other riders were really bad in the groups ahead of me (competitors did a u turn 25pct of the way in, so I got to see most riders that started earlier). I had no idea if it was happening in my later starting and smaller in number age group, so just tried to ignore the cheats and stick to my plan. About 45kms or half way in I hit the really hilly section - Upper Rosemount road. I felt great. Really really good. The hilly section had lots of people off their bikes and walking!! I was glad I was avoiding that, I was climbing well. This positiveness wasn't some pop book self-help sports phycology ranting to one self, I was the most controlled and held back I think I have been at 2 hours or so into an endurance event. Not my usual go till you blow self. I was moving well, feeling strong, nutrition good. I was looking forward to some serious hurting in the couple of hours that lay ahead. I climbed the last hill and now it's the final steep descent with a 90 maybe 110 degree turn at the end. There was an ambulance placed at the bottom of the hill, the only one on the course (was that a sign?) Second time down the hill, I was probably doing 70/80kph half way down, I see four people in front, on their brakes doing 40kph at very most, riding like triathletes ie not like cyclists! I have to make a decision, keep attacking the downhill and let them know I'm there and coming through, or slow up behind them and potter around and come out of the corner 10 secs slower. Descending fast with my ears pinned back I'm yelling "on your right" "on your right"
over and over, loud. The riders in front have to keep left unless overtaking. We come into the corner. They are all braking still (me thinks… so slow.. they should learn how to descend and corner ... .. my years of cycle racing and learning by following good riders down hills has me descending at a level above most, modesty aside). So I'm going fast, braking well and then, ... then, $hit!!!! one rider moves right across in front of me!! Almost rides sideways across the road to do it! WTF!!!!! And he's not moving back, staying on the wrong side of the road, taking the apex and not moving out ie blocking my line through the corner. I see it happening. Yell more. What the hell is he doing? I decide to try and bounce off him, but the angle is too big and my front wheel gets chopped away by the rear of his bike, only softly, but it's enough to lock my tyre like a brake. I'm catapulted into the air and then I'm upside down. Falling. Flat on to my back. Hindsight. I'm sure this rider was from overseas and didn't drift out of the corner as they were not used to moving to the left. That's the only way I can understand the line they took and kept and how I was chopped off... they were trying to stay outa my way.. just the wrong way!!! I land on my upper left back with a crunch. Left side of helmet and side of arm also smacked hard. Not good. Not dead but was wondering for 5 secs or so will I die? No. Seems by hearts still beating. I'm just winded maybe. Ok, keep eyes closed. Maybe I can hide from the pain. The Ambulance guys were there quickly and asking questions. Can you move your toes, fingers? They want to move me; I'm forced to open my eyes. They discuss sending me to hospital but then decide to wait a few mins as it would be hard transporting me from there. Anyhow ....we chat. They check my ribs, lungs, range of motion etc. They are less and less concerned and are starting to get surprised re lack of broken bones. One guy comes over and calls the fall “spectacular”, says - I could hear you yelling at them to stay out of the way from way back etc. I am talking to the ambos and saying lets just see if I go into shock etc. Seems I was great entertainment. I notice my new Garmin 735xt watch and new Rudy Project helmet were both smashed. That’s 1k gone...wonder how the bike is….. I sure wasn't roadworthy anymore…. Somehow, 15 mins later, I'm back in the race, or at least on the course. My intention is to get to the transition area back in town, slowly, and pull out of the event. The ambos were happy for this to happen ....they had checked my lungs and seemed to think I was ok - it's probably just muscular, maybe some cracks which we agreed they can't help anyhow. I did ask them about bandaging some cuts for me but they seemed not so keen as that would mean doing paperwork.... I think they were happy to see me go. Slink home with my tail between my legs… I ride the 20ks into Moololabah in a fair bit of pain left arm / side ribs. The bike speedo/computer turns over 3 hours and I'm annoyed because I won't even break 3 hours. "Really!" ….how embarrassing one part of me thinks, the other part (the small sensible bit) of my brain says wake up, no one cares. Moololabah is going off. The crowds are big and loud with cowbells ringing and lots of yelling in various languages. It's a beautiful day but I am in my own little world, no longer part of this racing one. Just transiting from A to B. Trying to not get hurt. I go to the officials in T2 run change area and say I am hurt and think I want to pull out. He bends down to remove my timing chip and I say stop, hang on, I will just speak to the medic first. I am in a chair at end of bike racks and ask a medic to check me out. I want to see if I'm ok before I wander off back to the apartment. I think I want him to tell me stop you’re damaged. I spend main in transition all up as he checks lungs etc. Medic thinks I'm ok lung wise, probably I've tenderised my rib eye - I think that's Queenslander for strained my intercostal muscles. He says I can carry on if I do things within pain limits. Within pain limits... what does that mean ... ?? I walk around a bit. Ok it hurts, but I can walk … So I decide to have a walk up the next hill, to the next timing mat, so people tracking me on the Internet in Sydney at least know I'm alive. Then I will pull out. Yes. That's the plan. Pull out. An official (Warren?) rides up on a Vespa rides up and starts chatting to me. I look at his badge and remember his name. I think we raced together back in the 80's. He puts my arm in a sling as I had been carrying it like that position. It doubles well as a place to keep a water bottle, chocolate bar etc (triangular bandages really are amazing!). Ina n encouraging “you can do it way” he tells me I have to finish the race. I walk a few more Ks into run course and the bandage is attracting attention now. Ok now I am not just a slow walker in a overpriced sleeved skinsuit… I am an injured one. Lots of people are saying "yeah way to go" "gotta get worlds medal" etc. I still didn't really care and it was a crap way to be spending the day. So I continue to shuffle along in my own little world. In truth it's hurting, but not too much. It's manageable, whatever that means. Goodness knows how many natural painkillers are flooding my body. At that stage I'm walking 11 min per Ks. I have always been a slow walker. I hate walking. Did I say that? J I just don't know how people can walk fast and then can't run fast. I'm only covering 5.5kms an hour and k am hurting. But now I am starting to think, hell I will finish this thing. Will probably take me 8hrs15 mins if my in the head maths is correct, but I will. I think I can, I know I can. One of two laps done ie half way of the 21.1ks woo hoo!! I wonder will I be last? Oh, hang on .. OMG. There is an 8 hour time limit!!! " I realise I won't make 8 hour cut off to get a finishers medal and finishers towel and it will still be a DNF next to my name. WTF!!! Do I care? I shouldn't. But I do now!!!! I'm doing maths like crazy, but my brain is not working. I think I need to drop to 9:30min ks. My fancy GPS watch is smashed from the fall, but I have my bike computer in the sling (picked it up when I got off the bike). Its battery is near flat, but I switch it on at each k marker to see the time of day and work out where I am pace wise. Maths n splits going around and crazy in my head. I'm still not going to make cut off. And to make matters worse I'm over hydrated and need to go to "port a loo" at every aid station. More time wasted. Aaagghhh. I want to finish within the cut-off time. Focus. How? Race craft. Walk the tangents of each corner. Can I "run”?? I manage 25 shuffle steps before breathing hurts too much. With 20 steps I recover. Punch out some blistering 9 min 30 Ks. Some of them I do walking backwards to see if it hurts less. I focus on passing some poor guy called Graham who is severe cramping and needing to stop. We chat and support each other but bizarrely swap positions multiple times. I think he's racing me as he gets 100m ahead. I'm going to have to stick with him if I am going to make cut off. About 13 ks in I eat some of a fruit bar I had stored in my bandage. I started choke as some gets caught in my throat. I can’t cough to clear it, now I really really think I'm going to die!! I’m trying to yell out help to the people I can see 100m up the road but I can hardly make a noise. I stumble into some toilets. There are no taps!! I need water … I can hardly breathe and I am sure I am going to have a heart attack. In the end I spy a family sitting over to the right. They are non-English speaking but somehow get a drink from them J Ok. Better. How much time did that cost me!! Man that was awful. At about the 17/18k mark, who appears in front of me, my mate from country Wagga Wagga, Mr nice guy Geoff Breese or Go Easy as he's known. He's finished and showered and come back to the back of the race to encourage back markers home -as he normally does. What a great guy - I'd be at the pub! He walks with me. Jogs little steps with me. Makes me laugh (that hurt actually!) and encourages me to look after myself, but keep moving to make the cut off. I can’t speak and walk (or jog) so it’s a very one sided conversation. Lucky he likes a chat J. At the 19k mark I know I I'll make the 8 hour cut off, I smile. Happy. Relief. Thanks GE. I see another friend, former top Pro, my former coach Matt Koorey (trannie MJK) he is having a giggle at me and saying“your allowed to pull out you know” (Matt knows this broken ribs in a race feeling only too well and I'm guessing is thinking of my health) I jibe back I'm getting the same medal as you mate! I laugh a bit and tell him to "F-off" as I walk on my way.. Although many have gone to the beach, or to the pub, many have stayed the last k is filled with people clapping etc.. I can't look sideways at anyone; it hurts to move that way. Finish shute.. I shuffle and think I want to cry. I raise my right hand a little and kinda wave to those that clap or encourage me (if I could see me I would think I was stupid ... but anyhow). The finish shute - not its normal sea of pain through exploding muscles and high heart rates, it's just one where my body is starting to relax as the jobs done... I cross the line. Did I smile at the camera or do anything? Don't remember. Some guy gives me a high 5 which I struggle to do but I say “thanks Mark”. ... who is that guy I wonder … why do I know his name … WAIT! That's 5 times Hawaii Ironman triathlon winner and legend Mark Allen. I'm not up for a chat though (I'm sure he wanted to talk to me;), so I just shuffle along to get my oversized plastic medal and an undersized towel. For some reason I do shed a couple of tears here.... relief, pain or disappointment.. maybe all. Results in – 7h:52m I finished 104th and last in my age group (of the finishers) and 4th last overall 8 mins inside cut off. I could never have imagined I could be that slow 8 hours earlier. I ask to go to medical again to get checked out. Again, they decide I'm ok. Give me a couple of bandages and send me on my way. More thanks to Geoff and his wife Cathy. They took me to medical, picked up my bike and clothes. Such nice people. The next day I pack up (with some help). It's kind of a struggle with multiple bags and bikes etc. I ask Geoff to take a few heavy back packs in his car and I will pick them up later. Somehow I take a backpack bike bag and bag on wheels to the airport and I'm off on the plane in Sydney. When we land I think I better get an X-ray - things just don't seem right, talking’s getting difficult. Fast Forward two hours later I'm admitted to Intensive Care at Manly hospital with 7 fractured ribs including 4 clean breaks at the back where I landed, a punctured and partly collapsed lung and blood pooling at the bottom of same. Neck collar for a few hours just to add to the fun! The next 11 days are a bit blur. Sleeping in a chair as I can’t lie down. Drugs every four hours. I can shuffle to the kiosk on about day 4. They make a good espresso and sell a fine choc mint magnum. I'm on 4 types of pain killers (love the opium based ones – hillbilly heroin I find out is its nickname!). The realisation that I can't go to Hawaii on holidays with the family is heavy on my heart and mind. I get out of hospital and I go home. Still sleeping in a chair. Still high as a kite. My ankles are swollen from sleeping in a chair. I’m back at work but struggling with pain and tidiness. I’m seeing a physio and working with sucking on a “Spirometer” machine to open up my lungs. Family away and living alone I feel pretty crap. Still have a Heamothorax at bottom of lung. Ribs are healing but very slow, another month or so for full healing I’m told. All I can say is fu.. if there ever was a vote for a crazy loonie triafalete, then you take the cake. Very much respect. Keep getting better mate - physically and emotionally. Great read. My life is so bleh compared to some of the stories you guys have. This sounds like a movie. I never think very much of myself as a triathlete beyond average and MOP. I am a bit hard on myself I guess so will try and put a spin on it. If you look at it statistically, I am often much better than average. Even now when I pick up old results I often as surprised that I was higher up eg top 10 pct usually overall, ie better than I think. If I had to pick my shiniest medal, I guess its winning a silver medal at ITU Aqulathon 2011 in Beijing. My first reaction is to say that’s because not many people race it etc etc. But I was second to Tony Duffy who is a bit of a legend himself, racing Tooheys Blue / St George I think post starting Tris in 81 - has won Australian Triathlete of the year in his age group (man if you think I have had some injuries…). The other guy for Australia that podiumed was Mick Maroney, I was bit in awe of both these guys. What else.. ? A lot of AG medals in recent year since under MJKs wing. Plastic medals I never look at them again but I like to try and win them and it’s a focus when I have to hurt in a race. Why not. Comment - when I came back to the sport a few years ago I was doing well in Aussie and State Olympic and Sprint AG’s, winning a few. I feel it’s a bit sad how little focus those races have now. Once upon a time it was “special” if you won your AG. State Tri organisations really should work at promoting this more IMO. Be a pretty stupid movie - straight to 3am made for TV me thinks ! Been busy. Bought a car today and leased a house. Time to focus on important things now..
Clearly some hammer themselves to retirement, doctors’ orders. At top level it demands professional training, yet the remuneration is crap for most. So I am sure some just walk away due to $. BUT... did they never “love” the sport? I started ‘cause I was curious could I do it? I’d seen Julie Moss crawl across my TV screen. How crazy was that!! Could I do that? And then I fell in love. With endurance sport and bikes and sports science etc. And mates. I love it. But you can be a top gun but never love it. So who would walk away first? Michael has skipped this one so far. And since last Friday he's been full on with family, work, and his rehab, and he had time with his kids over the same time period. He has already answered partly or at least indicated how hard it is to fit everything in. So unless he gets back to it maybe the question will be left there. Quite obvious when you think about it. Training full time for an endurance event is going to cut time from something else somewhere. Or if anyone else wants to add to that. Feel free to jump in now. I said yesterday to someone, I am not sure what day in the last month has been the worst in my life (there are a few candidates! It’s a hell of a time to be answering this question! ), it’s certainly been the worst month! Who have I turned to during this time? I’ve shared the details with twelve people, all but two are triathletes or runners. Amazingly six guys on here (four I know personally, two just via PM’s etc). What’s that say.. Chicken or egg.. I guess you choose your friends, and your sport. So if sport is important you, your friends will be from that demographic… lucky many are good caring people. So apart from two mates from school who live far away, and three other people through work or my wife, it seems endurance athletes (I have to extend the triathlon to running mates, a couple that could drown in a bathtub) are my only friends. Some of these people amaze me eg. Go Easy lives a long way away in my Dads old home town. What reason do we have for connection besides triathlon? Very little. Yet he is a guy that is always supportive and who recently went many hours out of his way to visit me in hospital (with his good wife). At the same time he sees me in a comeback from injury race a few years back (yes another comeback) and he stops in the run and walks ks with me to have a chat and help me along. Same day I see a mate from 80’s (Badger on here) who stopped to also walk ks with me (Nepean 2014 I think - broken leg comeback). Good guys, mates, that in a race they have trained months for decide people matter more. This is not the typical A type addictive personality represented by most triathletes. Then again you can (if lucky to have any) choose your friends. Like a good exam strategy. I am going to answer all the questions then go back and work on the harder ones Sorry this has taken so long. I think we call a scrum for a knock on but Im a bit behind on RL rules of the game these days - I am a firm AFL fan. I would have just said I'd call a knock on with the original attacking team to feed the scrum .... I will go with this my old school response. Your questions are amazing, but with this I think you forgotten one .... ? During a 44-day European tour in 1965, he competed 18 times and broke 12 world records, including the 20,000 m (12.4 miles). On 10 July, at London's White City Stadium, he became the first man to run 3 miles in under 13 minutes, lowering the world record to 12:52.4. Four days later, in Oslo, he lowered his own 10,000 m world record by 36.2 seconds to 27:39.4, becoming the first man to break the 28 minute barrier. De Castella first came to international attention when he won the 1981 Fukuoka Marathon in a time of 2:08:18, which was the fastest time recorded for an out-and-back course. It was not initially known to be a world best time, because his time was 5 seconds slower than the time set by Alberto Salazar in the 1981 New York City Marathon. It later emerged that the New York course was about 148 metres short. De Castella's time was later ratified as the world record. De Castella won Australia's first athletic World Championships gold medal when he won the marathon in 1983, beating Ethiopian Kebede Balcha by 24 seconds. Try was on when the knock on occurred. Penalty try under the posts. The knock on is adjudged to be deliberate. Sure that covers it. I wasn't thinking about Derek Clayton but sure. Deek and Ron Clarke. Adios and Cane Smoke in Australia. Cardigan Bay was NZ bred who raced until age 12. He was taken to USA and was also a champion winning stakes races until he notched up his 100 wins. He won 80 races in Australia/NZ earlier. Cane Smoke won most of his races on provincial tracks. Gammalite won 94 including all the top races. Derek Clayton seems to be the forgotten runner... To run a sub 2:10 marathon 50 years ago is amazing. It was amazing considering the training techniques available back then. And I'm not even sure if they took liquids or nutrition in those days. Thanks Michael for appearing on Ten Q's. Let's hope the thread gets the views it deserves. No. player has every right to go for an intercept. Attacking player should have thrown a dummy and gone himself. Referee has the discretion to award the penalty try if the player knocked the ball on to prevent the try. Happens all the time and never goes that way. Aside from K2 showing his poor knowledge of the NRL rules, reading between the lines here Ando, I hope everything is OK mate. A knock on is an infraction of the rules. Scrum down. A deliberate knock on is a penalty. And Ando is getting through but frantically busy. ... Ando is getting through but frantically busy. Thanks for the opportunity to do these 10 questions. As I said at the start there's a lot of "why pick me" ? But anyhow it was an honour and great fun. I should go back and add a few things. ... unfortunately, it's gone pear shaped since end Aug.
An edit 2 weeks on edit. I put a bit more here which is now deleted. I will update it when the status is a bit clearer. Too much information in a public space where people know both myself and my family. I'm very happy to say that I witnessed both of these podiums, and yes there was some very talented athletes there at that race. Maybe not quite the depth of some of the other World Champs but you can only race the ones who turn up on the day, and I think even Mick would agree there was some pretty fair athletes there on that day! Don't sell yourself short mate, you've won and podiumed your age group at numerous races and you've raced fair to do it. An Australian AG Championship and a World's podium is a pretty good effort I reckon. Definitely a champion in my book both on and off the course. 8. Combining high level training with work and family can be extremely taxing in all areas. In one way or another something has to give. Would you care to talk about that and how you managed it all up to now? I think you already know my thoughts mate, it's tough fitting it all in. It's a very fine line we tread between fitting everything in and it working for all parties, and something breaking and the whole lot coming crashing down. I was probably very fortunate that I'd witnessed the damage the later could do very early on when I was first getting into the sport, and I was always really guarded about letting the same thing happen to me. At times I'm sure I crossed the line of what was acceptable, but luckily somehow I managed to get away with it. It's probably a little bit like entering a corner a bit too fast on your bike... If it goes well, which most of the time it will, you'll get away with it with just a bit of a fright and a wake up call. If it goes badly, which it can sometimes do through even minor circumstances sometimes outside of your control, it can all unravel very quickly and the damage can be catastrophic. I think most of us have been there at one time or another, half way through that corner and for a split second having that 'Oh Sh!t' this could all end very badly feeling, but at this point there's nothing you can do about it. Luckily most of us come out of it unscathed, but unfortunately some don't. The difference is often just luck and circumstance. If it ends badly all you can do is pick up the pieces and try to put things back together. There's nothing you can do about the past, you can only move forward. Mja you've already proven that you can focus and excel in whatever you put your mind to and I'm sure getting over this 'crash', picking up the pieces, and moving forward will be no different. Good luck with the recovery mate.